I want to modernize site pages by following the .NET version of this Microsoft Blog: Modernize your SharePoint Pages I added the nugget package, I use a SharePoint Online Url. Could not find file 'C:\Program Files (x86)\IIS Express\webpartmapping.xml'. Altough I have the webpartmapping.xml in the project. 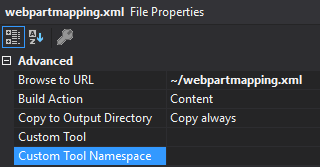 and the webpartmapping properties are "copy always". and moved it to the location given in the error.